Adopted 1/2.3inch 14megapixel Panasonic Sensor, NCC-HDMI200 14MP Button HDMI Industrial Digital Microscope Camera is conveniet for your real time observation and also USB port for research, without connecting to a PC, it can be directly connected to monitors, projectors and other equipments with HDMI port for real-time image preview, image capture and show the high quality video to users. The camera comes with a TF card slot, captured images and videos can be saved in the TF card. It also can be connected to a PC via USB2.0 interface. With remote controller, users can overly 8 pairs crossing line on the images, adjust auto exposure and control camera exposure, RGB gain and etc., Images has no shaking, high definition, they are the best choice for image acquisition. Up to 30fps high-definition image display, the image quality has been greatly improved. 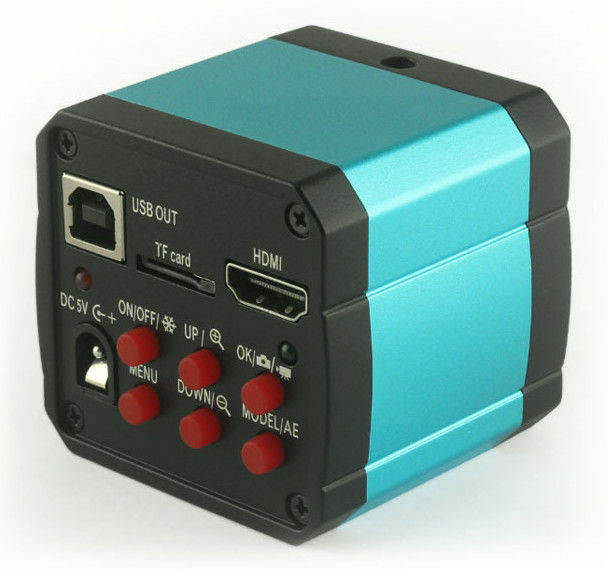 With remote controller, users can overly 8 pairs crossing line on the images, adjust auto exposure and control camera exposure, RGB gain and etc., Images has no shaking, high definition. On the basis of VGA camera, increased “Auto Exposure” function, the cameras will adjust the brightness according to environmental illumination to achieve the best preview effects. Captured images can be saved in the TF card. The camera also can be connected to a PC via USB interface for image analysis.